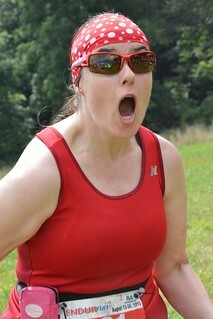 You can’t run very far in Run Waterloo without having a camera in your face. Our paparazzi is friendly, and they capture some amazing memories that all all free to use. Through the first four Stages of ENDURrun 2017, our photographers have posted over 3,000 photos to Flickr. Here’s what you need to know about them. Who is taking my photos? Our photo team is led by Julie Schmidt. At ENDURrun, Julie and Jeff Wemp are the main photographers you see out there. Where do the photos go? They are super easy to find right from results.runwaterloo.com. When the photo album is ready, a little camera icon will appear in the main list of events, and on each results page (see below). What can I do with these photos? Please feel free to use them however you wish. We ask that you credit the photographer (name tagged in Flickr) if you want to. If you want to use a photo for commercial purposes, please contact us first. Photos are easy to share from the Flickr app to social media, and anyone can download photos (even without a Flickr account). Do I need a Flickr account? To browse and download photos, no. An account will give you other abilities, such as upload notifications and the ability to tag photos (below). What else can I do with photos? If you’ve got some free time tonight, why not check out the albums from Stages 1-4 and drop a few tags! Where we take finish line video, we also tag that in the results as well. What if I need a photo removed? If you want a photo of your removed, or a tag of you removed, please contact us – we’re happy to help. Unfortunately for Taylor Kelly, the answer to that question is clear: this is still too early. When Taylor completed the 2016 ENDURrun, she signed up right away for 2017. 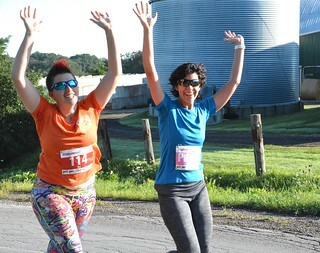 But training didn’t go as planned this year, and when she sustained a concussion at the end of July, it all but ended her chances of completing the Ultimate. She is glad she gave it a try, but had no expectations about finishing the first Stage, let alone the entire week. 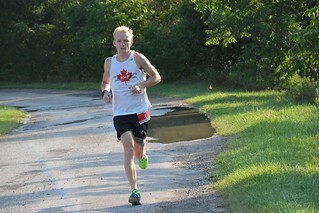 (36 of the 380 ENDURrun Ultimate attempts – 9.5% – have ended in a DNF.) I informed Taylor that she now owns the lucky record for fewest kilometres run for the ENDURrun Ultimate: 3. She laughed, and noted that since her concussion, she is eager to start training for 2018, as soon as her doctor clears her to resume activity. Lucky for us, her schedule as a teacher allowed her to still embrace the full week, even as she was forced to withdraw from the competition. More than previous years, this has allowed Taylor to embrace spectating and volunteering, and even though she would rather be running, she enjoys this new role very much. The rest of the volunteers do too! ENDURrun is a family tradition for the Kellys; father Patrick and sister Hunter. Between the three, they have six Ultimate finishes and counting. So as Taylor plans her wedding for August 2018, ENDURrun will be a factor in date selection (Patrick is serious about this), even if it means that Taylor won’t be able to participate. Hunter as signed up, Patrick will today (!! ), and Taylor is as motivated as ever to get healthy and back in the field. All the best for the upcoming year, Taylor! Quietly, Nick But is putting together an incredible run at ENDURrun 2017. Rob‘s Stage wins are appropriately grabbing the headlines this year, but Nick‘s performances this week are nothing short of awesome. After 5 Stages, Nick is cumulatively 20th all-time and he has a firm grip on the 2017 male Rookie award. We already knew that Nick is talented and well-trained, but how is our youngest 2017 competitor pulling this off? If you’re looking for ENDURrun advice, recovery is no secret. He is quick to credit his coach, Sean Delanghe/Health + Performance, and some Ultimate mentors and teammates including Dave, Vicki, and Val as valuable resources. He has certainly felt soreness, but has developed and followed a strict routine including nutrition, rest, compression socks, but never any massage. So far, Nick has been pleasantly surprised by how much he recovers each day. He has also found the carefully designed ENDURrun week to be helpful, by balancing terrains and rest (the whole rest day was especially helpful), and he’s glad to now put the mountain Stages behind him. And at 23 years old, being in the 3rd percentile of all ever ENDURrunners by age, certainly doesn’t hurt! Nick was swept up in ENDURrun hype in August 2016 when he became one of the first signups for ENDURrun 2017. It’s not hard to see why, as he was around for much of the week, captaining a Relay team, and running a spectacular 2:57 marathon. He admits that he wasn’t looking for motivation through signing up, but over the course of the year – through winter and injuries – having ENDURrun on the calendar has kept his training strong and focused. It wasn’t easy, but he never regretted it, and it’s showing why, now. He is already looking towards the Ultimate for 2018, but as he is graduating from the University of Guelph next April, he is wisely taking some extra time this year before deciding whether he will actually sign up. After an extended period without A races, Nick is excited to finally have the flexibility in his schedule to add some fast ones, including Fall 5 KM Classic or Road 2 Hope half marathon this fall. We know his fitness has come a long way and we’re looking forward to seeing his speed post-ENDURrun! Posted 3:36 pm by ENDURrun & filed under 2017. Five years between Ultimate entries is a long time. Of the 2017 Ultimate field, Merzi Dastoor has taken the second most years between Ultimate finishes (his previous was 2012). Many Ultimate runners compete for one single year, or run many, often consecutive years. Merzi was one of those one-timers until we were pleasantly surprised to find out in June that he was back in for 2017, if only because it is generally so rare to have such a large gap between entries. As his family has grown and as Merzi has kept busy with a variety of sports, he has also continued to be involved with Run Waterloo and ENDURrun, and it’s great for everything to come together for another Ultimate this year. So being back for the week, is it as he remembers? “It’s like coming home, again.” Except for the Stage 5 course, which is more technical and less flat than the last time! Excuse me if we’ve covered this before, but it’s the people and the food that really stand out as excellent, five years on. Merzi is lucky to have some good competition in the cumulative rankings, both in 2012, and again this year, with spots 4-10 separated by less than 20 minutes after Stage 5. Being in the middle of these battles has some perks, including that Merzi has a witnessed one of (many of) the cool on-course moments of ENDURrun 2017. For this we need some context: Catherine was trailing Vicki for 1st Overall by 6:43 after Stage 3. About halfway through Stage 4, Vicki made what she describes as a series of “rookie mistakes” – first by carrying fuel for the 10 miler, and then by stopping to pick it up – because she had dropped it! Merzi, who has had a back-and-forth battle with Vicki all week (the gap was less than two minutes after Stage 4), had the perfect view of the episode unfolding in front of him. Vicki turns around, which is a bizarre thing to witness in a race, especially with the Gold Jersey involved, and Merzi knows things are about to get interesting. And it would, as he sees Catherine make a move, and go on to extend the gap and win the Stage by 43 seconds, marking the first (and so far, only) time the cumulative leader has seen their lead decrease. It’s a case of right place, right time, and it only happens when battles are close. Thanks for sharing that. Great having you back, Merzi! Posted 9:11 am by ENDURrun & filed under 2017. One of the early storylines of ENDURrun 2017 was the enforcement of time limits, the tweaking of some limits, and the resulting community debate. In the months since, as 12:30pm on Tuesday, August 15 drew closer, not many people were more affected by that deadline than Michelle Barnes. Of the seven Stages, 3, 4, and 5 can be the tightest. Michelle Barnes has created two of the moments of ENDURrun 2017 with her finishes in Stages 3 and 4, coming in a combined 6:15 under the time limits. 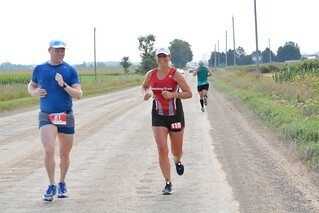 Michelle commutes over an hour each way during ENDURrun, so we conducted this interview by email. That gives us the opportunity, to publish in her own words, Michelle’s journey to this point and her outlook for this morning. “I originally withdrew from the event because I had a knee injury and I knew that my breathing would not enable me to finish within the time limits. I didn’t want to force the volunteers to stay longer because of me, and I also was very prideful. I’ve never DNF’d, so why should I intentionally put myself in a situation where I was guaranteed one? I stopped running for a few months, and during that time my knee seemed to have healed. So did my pride and ego. I started running again and realized that a DNS is worse than a DNF and that I should just do what I could. So here I am, not worried about missing a time cutoff because that’s not what ENDURrun is about. It is about pushing yourself to your limit. It’s about finding out just how strong you really are, even when you think you can’t possibly make it. It’s about supporting each other and having your ENDURrun family believe in you even when you don’t quite believe in yourself. I am so incredibly glad that I decided to run the event anyway, even if I do spend every stage doubting myself. I don’t think I’ll make the cutoff on Friday because of the ski hills, but I will still do my best and will be proud of myself no matter how long it takes me. Besides, there is a huge advantage to coming in last – I get the biggest cheering section! Michelle is currently halfway through her second lap here at Stage 5. Good luck! Update: Michelle made it in 7 minutes under the cutoff! How does she feel? “I’m shocked.” Congratulations! Posted 9:03 pm by ENDURrun & filed under 2017. It’s hard to believe that we’ve known the Putmans for eight years now. It took some prodding from Paul Mora and Mark McDonald just to get them into the Relay competition, and then several years of organizing teams (2010-2013) before Cathy finally took the plunge in 2014. Both she and Aaron have extensive histories of ultramarathoning, multisport, and international competitions, so it wasn’t until 2017 that we finally get to see them in action together. Throughout the years, ENDURrun has always felt like home to the Putmans. Although they live in Durham Region now, Cathy grew up in Kitchener, so the rest day is a good opportunity to spend time with friends and family, and of course, stop in at KW Health Connection. ENDURrun history is checkered with many couples, and the Putmans will join that group on Sunday! Posted 7:13 pm by ENDURrun & filed under 2017. Without a doubt, Jack Kilislian is one of the most enthusiastic ENDURrunners. In a community brimming with enthusiasm, Jack stands out. He is often one of the first runners to arrive and and one of the last to leave. He’s a fixture at all ENDURrun socials – including the rest day brunch, where we caught up with him today – and is well known for always lending a helping hand to volunteers. But Jack has another extraordinary claim to fame: more often than not, Jack is the first registrant for next year’s event (2018 included). Jack approaches the subject of ENDURrun training as a dedicated ultrarunner. He sees the training for ENDURrunning and ultramarathoning as complementary to each other. (This is a topic we will explore in depth over the next year). This year, Jack is able to enjoy the event a little more than usual, as it is the first year since 2011 that he hasn’t run an ultra the day before Stage 1! So you know where Jack will be on August 12, 2018. Who’s ready to join him! At the time of writing, we have Rebecca, Merlin, Ashley, Race Day Mark, and Maureen too! ENDURrun will be back for a 16th year in 2018. Join us August 11-19, 2018, for an unforgettable week of challenge and camaraderie. The base cost of the Ultimate is $400. We are offering a $50 promo code this week (ENDURRUNNER) for $50 off, which also includes a 2018 Run Waterloo membership, which will be available in the fall. Registration for Ultimate is open now; all other divisions will open later in the fall of 2017. Posted 7:38 pm by ENDURrun & filed under 2017. Such is Merlin’s state of mind at Stage 4. Flash back to Merlin Frey‘s attitude when he entered and finished the ENDURrun in 2015: he expected it was a one-time thing. But in the weeks leading up to ENDURrun 2016, he already knew he was missing out and decided that he would be back in 2017. Fast forward to Tuesday, August 15, 2017, and Merlin is having a great week, until a freak toe injury while assisting the ENDURrun race crew (“Dang!”) ended his week after three Stages. So when Merlin did not start Stage 4 today, he officially became a DNF in ENDURrun 2017. But his attitude is positive and he is already anticipating 2018 and beyond. Merlin has come from discovering running in 2009 to embracing the Run Waterloo community and making ENDURrun an annual fixture in his year. Merlin’s week will be a combination of spectating and volunteering. It’s great to have Merlin’s positive attitude around!